credit: Central Sod Farms, Inc. Cutting the grass with a dull blade promotes the growth of fungi that turn it brown. Are you one of those people who think there's nothing more to mowing a lawn than getting out the lawnmower and pushing it over the grass as fast as you can so you have time for a round of golf before dinner? Maybe that's why your grass is brown, has bare spots or is full of weeds. When you're mowing the lawn, you're actually pruning each blade of grass, and you should do it with as much care as you would when pruning a shrub. 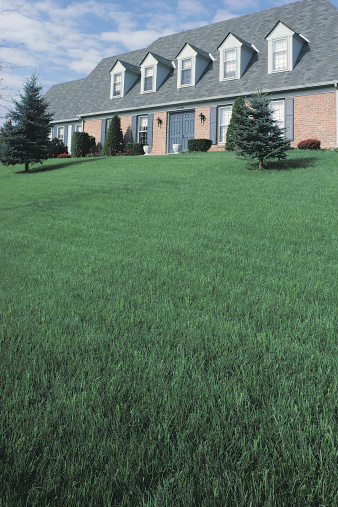 Besides producing a luxurious green lawn, proper mowing technique also helps protect the ground on which the grass grows, and it may even feed the grass. All these things are easier to do if your lawnmower is in good condition and you maintain the blade. We're not suggesting that forfeit your golfing date, but if you think of mowing as a nuisance activity that prevents you from getting on with your life, your lawn will suffer. If you take care of your grass with the same diligence you show your garden and your pets, it will reward you by flourishing. Here are some tips to help you give your lawn the care it needs. Set the mower height before you start. 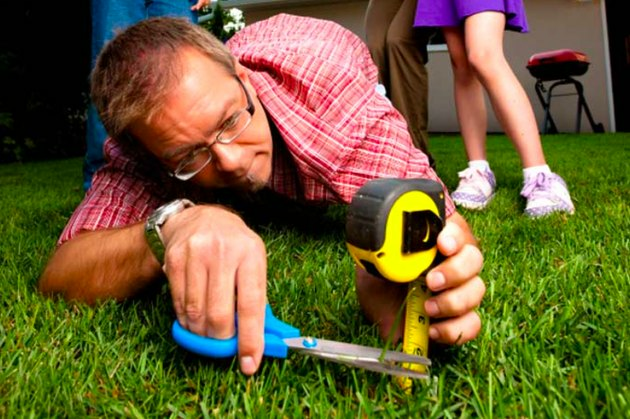 You don't necessarily have to get down on your hands and knees and measure grass height with a tape measure, but you should take steps to set the mower at the right height. The rule of thumb is to cut about a third of the length from each blade when you mow. 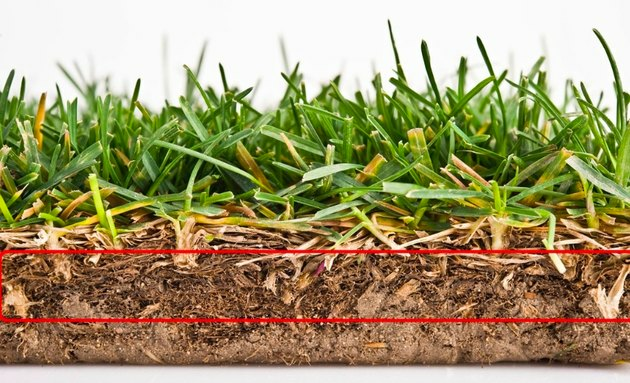 The grass will be able to establish roots more firmly in the soil if it has ample green surface area for photosynthesis. Cutting the grass too short weakens it and allows weeds to take root. The optimum length of the grass after mowing depends on what kind of grass it is. You can cut bentgrass fairly short—to a height of 1/2 to 1 inch—but most other varieties thrive when cut to a length of 2 to 3 inches. 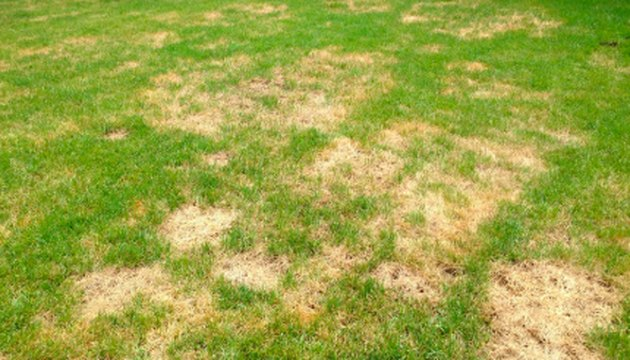 Warm-season grasses, such as Zoysia, Centipede and Bermuda are exceptions. Don't leave these any longer than 2 inches or cut them shorter than 1to 1 1/2 inches. 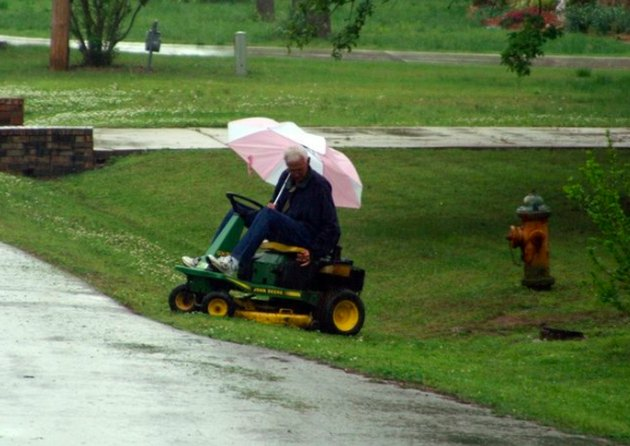 Mowing on a rainy day is a bad idea. Grass is much more difficult to mow when it's wet than when it's dry. When the grass is wet, it bends over when the mower passes, so you usually have to make two passes to cut all of it. The cuttings clog up the mower housing, and they form clumps on the freshly mowed lawn. What's more, the wheels of the mower may tear up the water-saturated soil. If you're in the middle of an extended period of rainy weather, and you can't let the grass dry out, be sure to sharpen the mower blades before mowing, because sharp blades are essential for doing a good job. You should overlap each pass by 50 percent, but even if you do, it's a good idea to come back and do a second pass to cut the blades you missed and redistribute any clumped cuttings. Clippings nourish the roots and make your lawn healthier. You may have heard that leaving clippings on the lawn creates thatch that starves the roots of oxygen. That's a myth that was debunked by a study at the University of Rhode Island in the 1960s. Far from harming the lawn, the clippings decompose and provide fertilizer, thus strengthening the roots and improving the color and texture of the grass. Feel free to turn the mower ejection port toward the part of the lawn that you've just mowed and letting the clippings fly where they may. Mulching mowers, which have no side port and keep the grass clippings inside the mower chamber where they are cut multiple times, are an even better choice. The only time when this might not be a good idea is when you're mowing wet grass, because the clippings form clumps that can smother the roots. However, if you mow twice, or you spread the clippings with a rake after mowing, this shouldn't be a problem. Keep the mower blade sharp to protect the grass. A sharp blade cuts grass cleanly, but a dull one rips and tears, leaving the grass with a rough edge and in a weakened condition that makes it more susceptible to fungus. 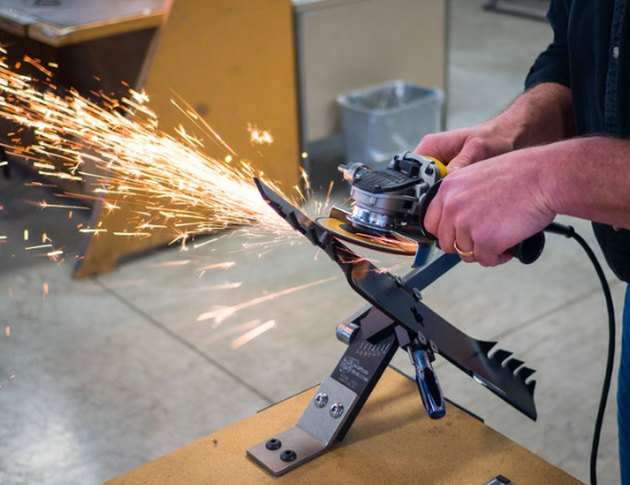 It pays to invest in a handheld or bench grinder and to remove the blade once a month and hone the edge. You can also do this with a file. You don't need a knife-edge on the mower blade—you just need to remove pockmarks and nicks left from stones and debris. After running the blade over the grinder, balance it by hanging it horizontally on a nail in the wall and making sure it remains level. If it sags to one side, lighten that side by removing more material with the grinder. 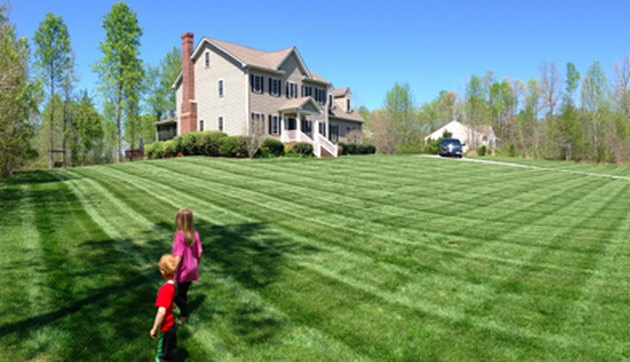 Varying the mowing pattern protects the soil and creates a better-looking lawn. Greenskeepers and maintenance personnel for football and baseball fields know the importance of cutting pattern, which is why the grass the cut looks so smooth and textured at the same time. There's a more practical reason for varying the cutting pattern each time you mow, though, and that's to prevent the mower wheels from wearing tracks in the soil. 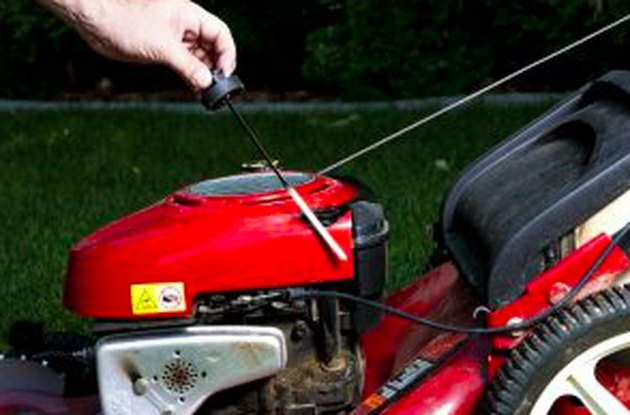 Keep your mower in good working order by giving it regular maintenance. The type of maintenance a lawnmower needs depends on the model, its age and how often you use it. Most mowers have a 4-stroke engine with a separate crankcase for the oil. Check the oil each time you use the mower, or you could end up with a seized engine and a stiff repair bill. After every use, clean cuttings off the underside of the housing. When you leave them, they provide a haven for mold that you will probably transfer to the lawn the next time you mow it. Change the plug and air filter at the end of each mowing season, and empty the gas tank —or pour in some gas stabilizer—to make sure the mower is ready to go in the spring. If you give your mower the same TLC you give your car, it will make mowing that much easier, and your lawnmower will last for years.